Bitcoin Future Review, Viral Bitcoin Future SCAM Exposed! Green Millions Review, Is Green Millions SCAM Viral? Cannabis Blueprint Review, Viral Cannabis Blueprint SCAM Exposed! Cannabis Fortune Review, Viral Cannabis Fortune SCAM Exposed! Green Leaf Fortune Review, Fake Green Leaf Fortune SCAM? Yes! Cannabis Trader Review, Viral Cannabis Trader Scam Exposed! Oh no not again! The greedy con artists from Bitcoin Future SCAM are back and they are gunning for your wallet. 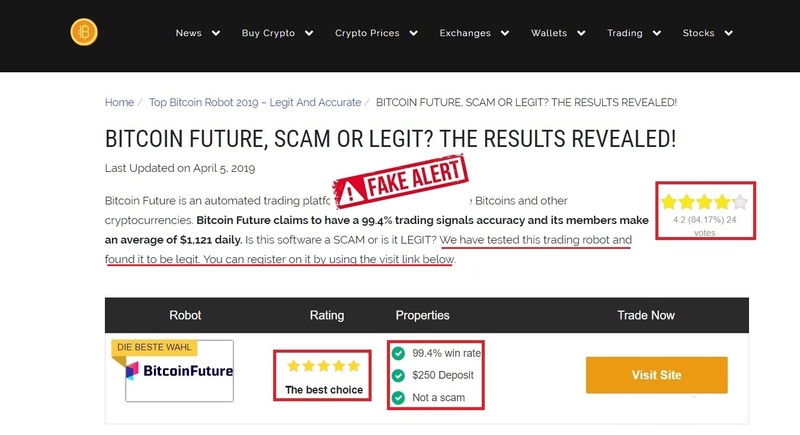 Our Bitcoin Future review proves that we are dealing with a viral scam which is being promoted very aggressively these days by a bunch of affiliate networks who are collaborating with offshore Forex and CFD brokers. CFD means contracts for differences, and it is actually a legitimate way to trade bitcoin contracts, but the Bitcoin Future scam has nothing to do with real cryptocurrency trading. In fact, the exact opposite is the truth and we were able to produce enough proof to show you just how deceptive and misleading this new get-rich-quick scheme really is. In all honesty, we were shocked when we saw fake Bitcoin Future reviews flooding the internet, and the fact that the people who are publishing these reviews are owners of what seem to be “reputable” news websites exacerbates an already tense situation. Bitcoin being the way it is attracts a lot of negativity along with the money it generates for a lot of people, and these fake review websites are doing much to contribute to this image many people associate with Bitcoin. Additionally, there are also multiple fake news campaigns which are very active these days, and they are designed to trap you and get you signed up with a fake offshore broker. Want to know more? Keep reading our Bitcoin Future review because we exposed these crooks and how they operate! OK so this is the Bitcoin Future registration area and where they promise to make you a millionaire. Please don’t believe it! 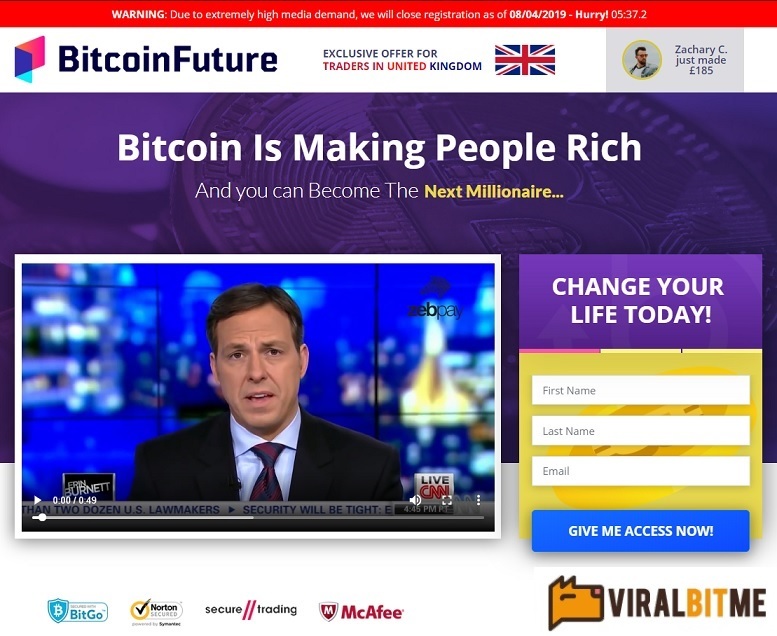 Here is an image of the fake Bitcoin Future reviews website. These people have no shame, and they should be punished for deceiving innocent victims by telling them to join an obvious scam. FYI, it’s not possible for any trading software to generate a 99.4% win rate, that is a really stupid lie. And here we have a collection of fake news clippings which are associated with these types of scams. Most predominant is the use of the Bitcoin Future scam with the cast of the Dragons Den and Shark Tank. Bitcoin Future – What Is It? The Bitcoin Future scam purports to be an automated Bitcoin trading software that will make you a millionaire in no time. They say that it has a “laser-accurate technology” which makes it execute trades faster than other apps, but that is a lie. Bitcoin Future Review, SCAM Or Legit Bitcoin Trading Software? Enter at your own risk! Bitcoin Future is a cloned website and fraudulent online Bitcoin trading software. It is about to be blacklisted by the entire online trading community, and is directly responsible for defrauding hundreds of unsuspecting victims looking to cash in on a genuine Bitcoin trading app. All the testimonials are fake, the signals are not real and taken from a closed system, and the sales video is rehashed from other scams mentioned in various websites. Namely Bitcoin Trader, Bitcoin Revolution, and Crypto Revolt. No one said its free so don’t expect it to be. It will cost you at least $250 to get in, and after that if you are lucky they will leave you alone only if they believe you are broke. So don’t let these greedy scammers think otherwise. OK so if you are in the market for a reputable system that actually produces results, we have something in line for you. Our systems have been around for a while and known to generate much profits for many satisfied customers. Take a minute to check out our recommended apps, we did all the testing and we can tell you that our apps perform as advertised. The Bitcoin Future SCAM is just another pathetic get-rich quick scheme which is about to get smeared and blacklisted very badly by industry-leading review sites. There are many people asking about the Bitcoin Future scam and with good reason. They are being enticed by Facebook bots and fake review sites who are telling them it is smart to invest using this system. However, once they risk their money its gone in a New York minute and you can pretty muck kiss it goodbye. If you have any questions or want additional information in regards to the Bitcoin Future SCAM please make sure to message us via our contact page. 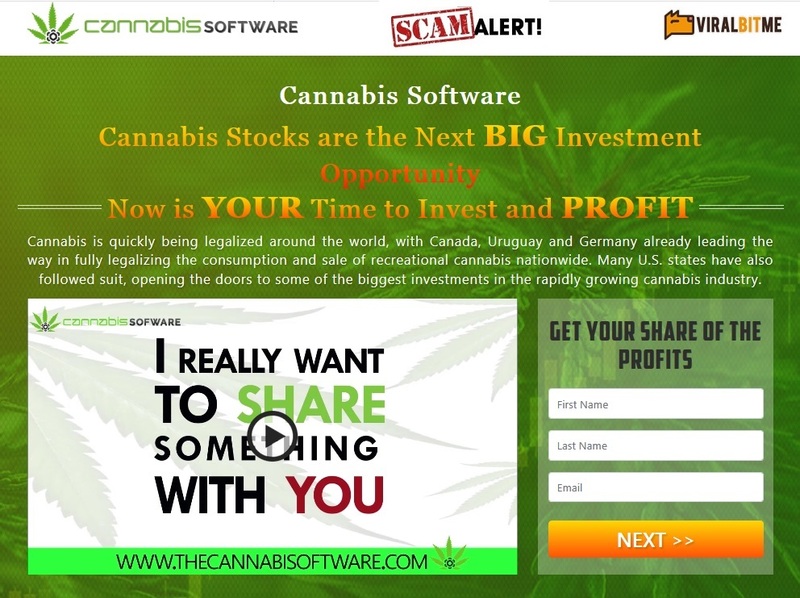 Pot Stocks are going through the roof and the greedy scammers behind the Cannabis Wealth SCAM CFD trading platform are exploiting all the media hype and baiting unsuspecting victims looking to cash in on a genuine cannabis investment software. “Cannabis Wealth” by Jacob Walters the Fake CEO is more than a simple term, it is the name of the latest Cannabis CFD SCAM which is now being launched by multiple affiliate networks and media agencies whose sole purpose is to get you signed up and depositing funds with an unlicensed offshore broker like WiseBanc which has a registered business address in the Marshal Islands. So you are probably asking yourself “Why Am I Being Targeted?” The answer is simple, the legalization of cannabis for medical and recreational purposes is making major headlines on the mainstream media across the world, and scammers are not oblivious to these trends. They will exploit this information and manipulate the facts in a way which best suits them. What does that really mean? Brace yourself and get ready to be spammed with various fake cannabis offers and get-rich-quick schemes offering you and easy way to become a millionaire overnight. You will also be exposed to a barrage of fake news stories as well as fake reviews from various affiliate websites such as (but not restricted to) HYIP monitors, binary options, cryptocurrencies, stocks, business opportunities, work from home, MLM, and Forex/CFDs. They will all speak praise and endorse various cannabis investment platforms such as the Cannabis Wealth SCAM citing fake claims and making unsubstantiated claims about how easy it is to generate massive wealth very quickly using this “profitable new system”. But we know better and we shall expose their dirty little tricks! It’s also critical to point out that Cannabis Wealth is a cloned app and a facsimile copy of the Weed Millionaire system. We will explain this in detail and provide an explanation as to why we reached this dire conclusion. So if all of this is starting to sound like you are being setup to take a fall then you would be correct. We actually invested using the Cannabis Wealth app, and the facts speak for themselves. Want to see why we blacklisted this system? Keep reading our informative Cannabis Wealth review and see why customers are complaining! Below you will see the main sales page and registration area for the Cannabis Wealth app. 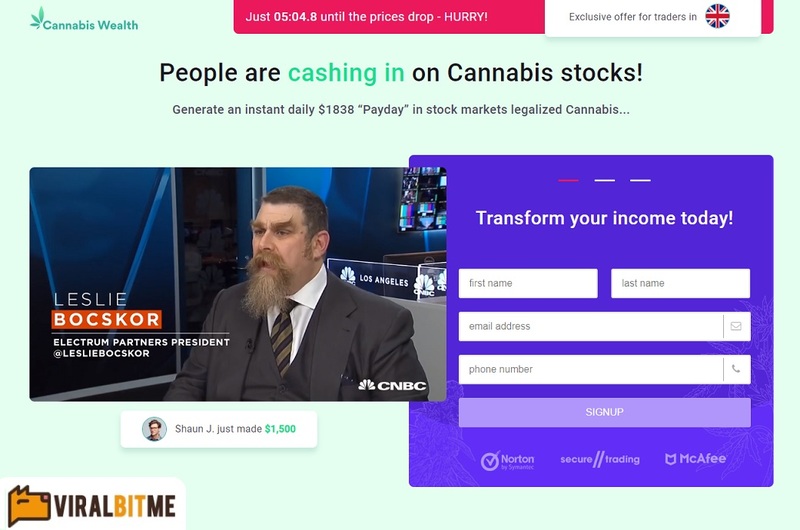 You can see where it says “generate an instant daily $1,838 payday in stock markets legalized cannabis”. In that same exact sales page we found a picture of Jacob Walters who claims he is the CEO of Cannabis Wealth. However, a quick check revealed that Jacob is really an image bank actor and his picture is posted all over the internet (see proof below). If this isn’t enough, the whole testimonial section is forged and totally fabricated. We attached a screenshot taken from the Cannabis Wealth website and it is very plain to see that there is not one single genuine testimonial listed as a legitimate point of reference. Here we have the Cannabis Wealth software. We previously mentioned that Cannabis Wealth is a cloned app, and here you can see for yourself that the scammers are using the same software, just branding it differently and using different graphic design. This is because Cannabis Wealth and Weed Millionaire are powered by the same software, which is really a turnkey solution for unethical affiliate marketers and media agencies who want to refer paying customers and get their commission checks. Hence the obvious conflict of interest. There is also a massive fake news campaign which is active right now. In this campaign the scammers are illegally using the names and reputation of real investors from the Dragons’ Den, Shark Tank, as well as other wealth gurus such as Elon Musk and Richard Branson. They are using false advertising tactics in order to make their phony sales pitch more believable, and that is extremely deceptive and misleading so stay on your toes. 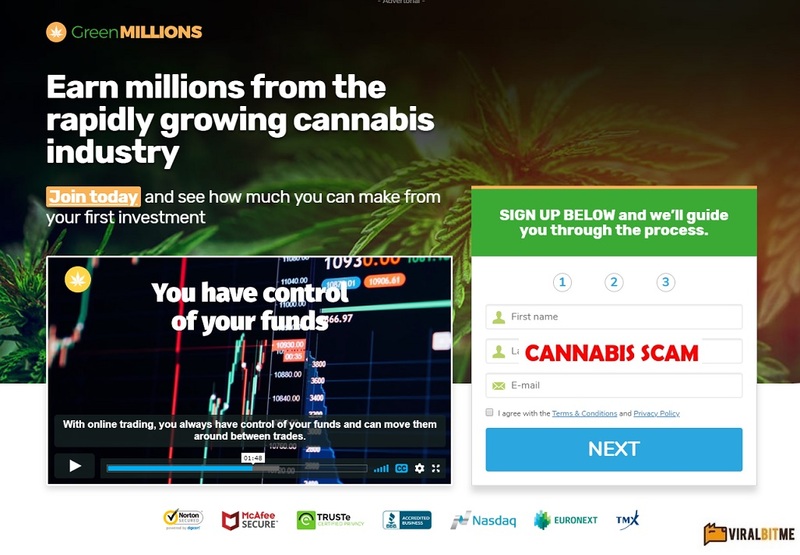 There are seemingly legitimate websites with a clean and polished look who will talk about legitimate investing opportunities and leverage that in order to sell you this fraudulent cannabis trading software. Don’t believe it and don’t bother signing up despite how convincing their reviews may be. Just stay away and save your money for something that actually works. CFD’s or contracts for difference are a popular forms of derivative trading. Unlike stocks, CFD trading allows you to speculate on the rising or falling prices of the global financial markets such as indices, commodities, currencies. CFD’s are legitimate trading instruments which are easier to use than stocks, but there is also much risk involved. What is Cannabis Wealth, How Does It Work, and Who Is Jacob Walters? Cannabis Wealth is advertised as a kind of system which executes strategies used by successful investors such as Warren Buffett and generates profit 100 Times your income for life. There is no mention or reference to the technology which powers it or any kind of back testing which was done. Walters is presented to us as an experienced CEO from the Hedge Fund industry who sold two companies for the combined sum of $25 Million Dollars. They say he helped Mark Cuban make his first million. In reality this person does not exist and was created for promotional purposes. Cannabis Wealth Review, $1,838 Daily Or SCAM? We checked. Cannabis Wealth was NEVER featured at ANY commercial channels in the world and never mentioned by CNN, Forbes, or the Financial Times. In Reality Cannabis Wealth will not execute strategies “from the most successful investors that will guarantee you to 100X your Income for life”. The only thing which is simple and fast is the way the ripoff artists steal your money. Additionally, there is no “immediate Cannabis cash secret” which will generate passive income for you on auto-pilot (it’s a lie). They are saying that you don’t need any education to use this software and there is a mention of the “NASDAQ Loophole”, but it doesn’t provide clear explanations about the loophole other than saying that you will be using a “brilliant revenue system”. In other words, its a complete fraud so don’t invest and don’t say we didn’t warn you. Absolutely not. You will need to part with at least $/€/£250 if you want to gain access to this filthy app. That money will be charged to your credit card by the thieving broker which was assigned to you. Some Viable Alternatives. Yes, There Are Some That Actually Work! We have been approached by various networks and asked to promote their software. However, non of the software they offered managed to produce income consistently as advertised. Still, we were able to find one system that actually delivers as promised. Trade Cannabis Stock is exactly that software and we invite you to check it out and give us your opinion. The Cannabis Wealth SCAM software, app, and fraudulent trading system is a blacklisted Cannabis SCAM (verified with proof). We are advising all our members to refrain from joining this program recommend you start using a legitimate cannabis trading app as we have made one available to you. Should you have any additional questions or need clarifications, please message us through our contact page. Welcome to our Green Gold review and SCAM Cannabis CFD stock investigation. While it’s true that nothing gets your portfolio high like Cannabis Stock, the Green Gold SCAM is a perfect example of a stock trading platform which has nothing to do with legitimate Cannabis CFD trading. In fact, this fake app is actually a get-rich-quick scheme (confirmed). 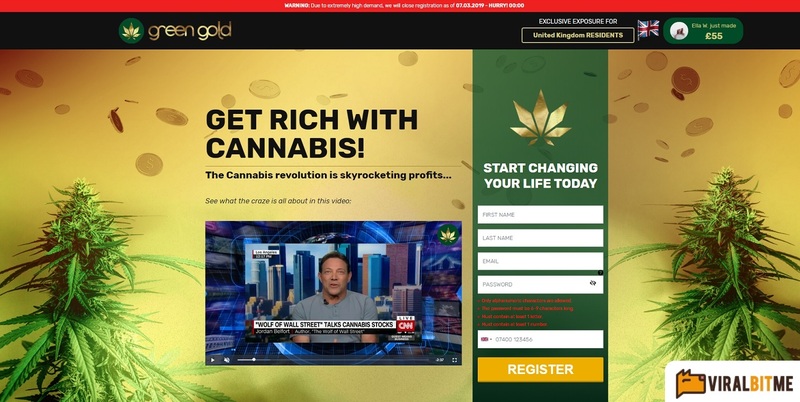 Green Gold is not just a term or gimmick, it is the actual name of the most recent and viral cannabis scam which is being promoted right now by a very crafty and unethical affiliate network. Its also important to point out that this fraud network is operating in tandem with rogue offshore brokers, in our case it was XMarkets which has a registered business address in the Marshall Islands and a very nasty reputation for defrauding unsuspecting victims looking to generate some passive income online. Despite everything we still had to give this software a chance, so we actually invested our own money and put it to the test. Needless to say we lost all our money in about 15 minutes and had an obnoxious sales rep with a funny accent call us up night and day trying to get us to re-invest. Why is this happening now? Simple! The legalization of marijuana for medical and recreational use! Greedy scammers are riding the cannabis wave of success and latching on to it by peddling fraudulent CFD trading systems such as Green Gold. But we are on to their tricks, and as our fair and impartial Green Gold review will show, we were able to expose their dirty little operation with verified proof and evidence. So yes, if you want the short answer Green Gold is a Blacklisted cannabis scam, and this review was prompted by complaints. However, if you want to check out the detailed explanation keep reading and make sure to hold on to your wallet because these scammers are persistent and will stop and nothing to get their dirty little fingers on your credit card. So here we have the “Green Gold” main sales page and registration area. As we previously stated, they are literally saying “get rich with cannabis”. There is no explanation as to how the software works, or even what to expect. Just some out-of-context news snippets and then signup to start making money. OK so here is the Green Gold testimonial section. Obviously it is plain to see that all the testimonials are fake and used in a very manipulative and misleading way. We took a screen shot of “John Jane’s” testimonial and right next to it we added an image of the actor for reference. You can check it out for yourself if you want to see it with your own eyes. And here is the clincher. When we registered we got this popup which tells us who our broker is and what kind of bonus offer to expect. This popup is an exact duplicate which was integrated with the Cannabis Millionaire scam (and others). Here is the most interesting part of the scheme. We found out these cheaters are using fake news articles on search engines and Facebook in order to trick and bait people into joining their program. This is extremely troubling, and we also saw that they were illegally using the names and reputation of other wealth gurus like Elon Musk, Richard Branson, and members of the Shark Tank for false advertising purposes. So stay alert and don’t take the bait because we can guarantee that you will lose your money if you get tempted and decide to invest despite our warnings. What Is Green Gold and How Does It Work? The Green Gold scam is a verified get-rich-quick scheme. No where does it mention how the software works. Nor is there any discussion in regards to the technology which powers it. There is no back testing or any type of serious numerical analysis in regards to the profit and loss ratio. The Green Gold SCAM is one of many cannabis scams which are now springing up like mushrooms after the rain. The use of catch phrases like “Cannabis revolution” or “live the dream” should be viewed as alarm bells which serve as constant reminders that we are dealing with con artists who use excessive, deceptive, and hyped up language in order mislead and bait unsuspecting victims. The aim of the crooks who are pulling the strings behind the scenes is to get you signed up and depositing with an unlicensed offshore broker. When that happens these online promoters get commission pay checks wired to their bank. This type of activity is commonly referred to as a revenue or profit share scheme. Some of the top marijuana penny stocks are Canopy Growth Corp (NYSE: CGC), Aurora Cannabis (OTC: ACBFF), Aphria Inc (OTC: APHQF), and he Cronos Group (CRON). But none of these penny stocks are mentioned in any section of the sales page, and there is no reference to the market caps or any type of technical analysis for that matter. In other words, what we are looking at here is a not a genuine weed stock trading platform. Green Gold is a typical cannabis scam which employs the most common fraud tactics such as (but not restricted to) fake testimonials, inflated bank accounts, hyped up and exaggerated claims of easy money, and out right lies and fabrications. There is nothing of substance or value here, and there is definitely no return on investment for anyone willing to risk their money using this fake cannabis investment platform. The truth is that Green Gold is the exact opposite of what it claims to be! It’s a losing system designed to defraud you and steal your money. Pricing. No, Its not Free! Accessing the Green Gold SCAM will cost you at least $/£/€250 (sometimes even more). This money will be charged to your credit card by the broker which is linked to your account, and these greedy ripoff artists always want more. Unlike Weed Millionaire, we have not seen any Green Gold Reviews (fake or real). In fact, we are the first ones to publicize this scam and we sincerely hope others will pick up the gauntlet and continue to expose these criminals. If after reading what we have to say about this latest fake cannabis trading software you STILL want to invest using this Green Gold, then we recommend you refrain from any form of online trading as it is most likely not for you and you will surely end up losing your money. A Tested Alternative That Works! On the flip side, our staff did some serious digging around and was able to identify a truly profitable automated cannabis trading system (robot). Trade Cannabis Stock belongs to a rare breed of auto-traders which produce results consistently as advertised. We tested it, and after investing €500 we were able to quadruple the amount and cash out after 8 business days. So take a minute and check it out! Green Gold Review, Summary, Conclusions, and Helpful Tips! The Green Gold SCAM software and fake trading app is a blacklisted cannabis get-rich-quick scheme which must be avoided. We encourage you to get educated and research before investing, or at least let us do the research for you. Cannabis stocks are very popular now, and this trend seems to be gaining momentum by the day as regulation kicks in and more interest is being generated by the media and social networks. It’s always smart to check and if you are not sure feel free to message us through our contact page. “Earn Millions from the Rapidly Growing Cannabis Industry”, WOW what an original sales pitch for another get-rich-quick scheme. Be that as it may, that is the opening sales pitch for the Green Millions SCAM. But what is “Green Millions” anyway? We found it peculiar when some of our viewers reached out and started asking us this exact question. So in our impartial Green Millions review we shall attempt to answer this question, and explain in detail why we believe it is a blacklisted Cannabis CFD SCAM. Green Millions is what we like to call here at ViralBitme a Copy/Paste or chain scam. It means it is a type of template which uses similar design and text, but the core elements (in this case the actual sales video) stay the same. We have also received initial reports that a well-known affiliate network is responsible for producing and promoting the fraudulent Green Millions software. In fact, the Green Millions system does not really answer to the criteria of a software. This is contrary to the fact that “online trading” is the main theme of this latest ruse. In reality what we are looking at here is another absurd attempt to ride the recent cannabis “wave of success” which was prompted by regulatory easing and permitted use of medical and recreational marijuana. We have seen this type of scam before, and Green Millions is only different because its not orchestrated by the same crooks (everything else is the same). Just like every scam there is a huge difference between what you see and what you actually get. The overt part of what you see is just a fancy, hyped up sales page with a promise an amazing way for you to make millions by becoming a part of the growing cannabis industry and making your first investment. The covert part of the scam is what you are not aware of, and that has to do with the fact that there are very unsavory characters who are the actual puppeteers pulling the strings behind this sham. These crooks are actually unlicensed Forex and CFD brokers who are engaged in what is commonly referred to as a revenue share scheme. This means that in this case a broker named XMarkets, which is a horrible broker with multiple online complaints is colluding with promoters and fake review sites in order to defraud you and steal your money. Still believe Green Millions is a genuine online trading system? If that’s the case we highly recommend you read our detailed Green Millions review before you pull out your wallet and decide to invest. Below you will see the Green Millions main sales page and signup form. If you take a look inside the sales video you will see a sentence which says “You have control of your funds”. A quick look below illustrates exactly what a chain scam really is. If you look closely you will see a screenshot of two similar scams. One is named “Cannabis Craze” and another “Cannabis Profit”. It’s really plain to see that this is a cloned software and part of a series of scams which use the exact same footage, only brand themselves differently. What Are CFD’s (Contracts for Difference)? A contract for difference is a contract between a buyer and seller, stipulating that the seller will pay to the buyer the difference between the current value of an asset and its value when the contract expires. The perceived benefits are clear. This means that as opposed to stocks for example, you don’t actually have to own the contract merely have the ability to trade against it and get paid according to the difference. CFD’s are also easier to trade with and more accessible to the public as opposed to stock options. The liars behind the Green Millions scam would have you believe that their system uses legit CFD contracts, but that couldn’t be farther than the truth. What Is Green Millions and How Does It Work? Green Millions is an over-hyped, deceptive, and misleading system. There is no software or any type of secret trading algorithm, and there isn’t even a simple explanation as to how the software is designed or how much back testing was conducted. In other words, its a SCAM so just stay away. Green Millions Review, You Will Not Become and Instant Millionaire! Don’t you think it’s time to take back control of your money? With online trading you can do just that! That is how the sales pitch for the Green Millions scam starts. They say you never have to worry about the economy crashing because with online trading you can even earn money when markets fall. They claim that putting your money in the bank is like giving it to a stranger to gamble with. With online trading you always have control of your funds and can move them around between trades. They say that they want to “bring trading to the masses and stop it being controlled by the elite”. But they can only do that and create a better and more financially free world with your help. In reality this is a trap. If you take the bait your money will be devoured immediately by thieving offshore brokers and they will pressure you over the phone to continue investing and losing more. Yep. They charge at least $/€/£250 and you can bet your bottom dollar that these crooks will do their utmost to get more money out of you since they view you as their personal cash cow. That’s just how it is and it’s not going to change. For sure, we have seen various fake Green Millions reviews which originate from a different websites who wish to “educate” their members in the art of money-making. Well, we know they are getting kickbacks for endorsing losing software but that is a different issue altogether which we will not address at this time. We have checked initial reports about Green Millions scam being used with the cast of the Dragons’ Den. There were other inquiries about Green Millions using the names of wealth gurus such as Elon Musk and Richard Branson. For the time being we could not find any proof of this type of false advertising practice. 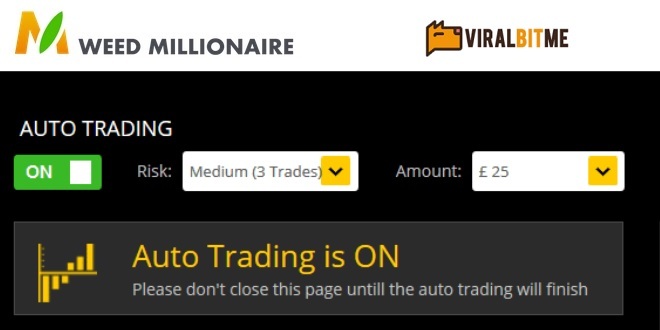 If you are still under the impression that Green Millions is a genuine online CFD trading system, it means you are sold on their fake app and will end up losing your initial investment or worse. We implore you to consider your options and refrain from signing up to Green Millions. On the opposite end of the spectrum we were actually able to identify a reputable cannabis trading system which executes trades on complete auto pilot. That software is named Trade Cannabis Stock, and we have tried it ourselves and generated around €1,574 during the first two days after investing €350. So yea, we are recommending it for sure as it is also consistent! The Green Millions scam software, app, and fraudulent CFD trading system is a BLACKLISTED Cannabis SCAM and that is a confirmed fact which can’t be disputed. We know exactly who the people behind Green Millions are, and these crooks are located in Eastern Europe. They have a checkered reputation and are recognized as very skilled scammers in the online trading and Forex niche. If you require additional information or evidence of scam in regards to Green Millions, please reach out and message us through our contact page. Cannabis stocks are on fire, and the crooks pulling the strings behind the BLACKLISTED Cannabis Blueprint SCAM software and CFD investment platform are not wasting any time! In our detailed Cannabis Blueprint review, we will demonstrate and provide proof of how a group of savvy affiliate marketers and media agencies have invented a fake persona named Dr. Pettle, and are using lies and half-truths in order to promote their filthy get-rich-quick-scheme. You are probably asking yourself why is this happening now. The answer is quite simple. There is much hype around cannabis now because regulation is kicking in and ripe new markets are opening up. What does this mean? A few things, first you must understand that there are crooked Forex and CFD (contract for difference) brokers involved, and they are the ones who are providing the actual trading environment (that’s where you get scammed). When we signed op our broker was XMarkets, which is owned and managed by SG INNOVATION LTD, and has a registered business address in the Marshal Islands. These brokers are in it for the money, and they WILL rob you blind if you don’t know what you are doing. On top of that there are multiple fake Cannabis Blueprint reviews, fake advertisements and infomercials, scammers with fake Facebook profiles and Telegram will also try to cheat you, and various HYIP monitors, cryptocurrency, binary options, and Forex review websites will also try to convince you that you can “generate a massive amount of money” using the Cannabis Blueprint system. COMPLAINTS: Get ready for SPAM emails marketing, deceptive and misleading advertising, declined withdrawal requests, and overcharging on credit cards. 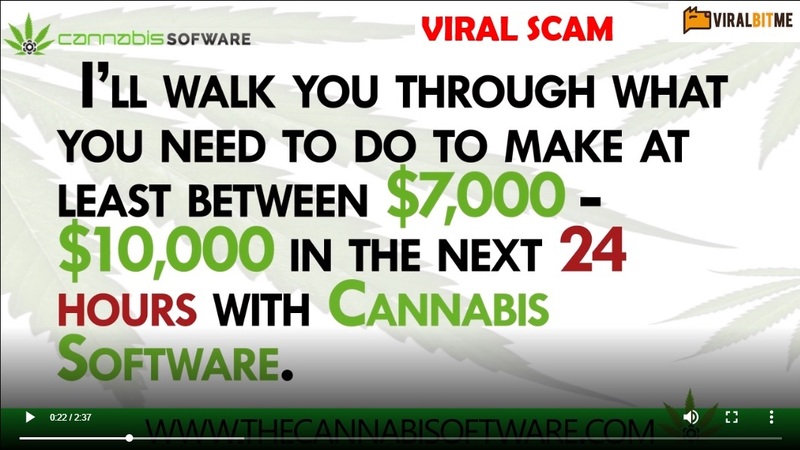 ViralBitMe is first to expose the Cannabis Blueprint scam software, however there will be others who follow! So, If for some unknown reason you feel an urge to risk your money and invest through the fraudulent Cannabis Blueprint trading app because you believe it a genuine or legitimate software, then we highly recommend you continue reading our Cannabis Blueprint review because we have proven these liars are trying to cheat you out of your money. So here we see the primary sales page and registration area for the Cannabis Blueprint scam. 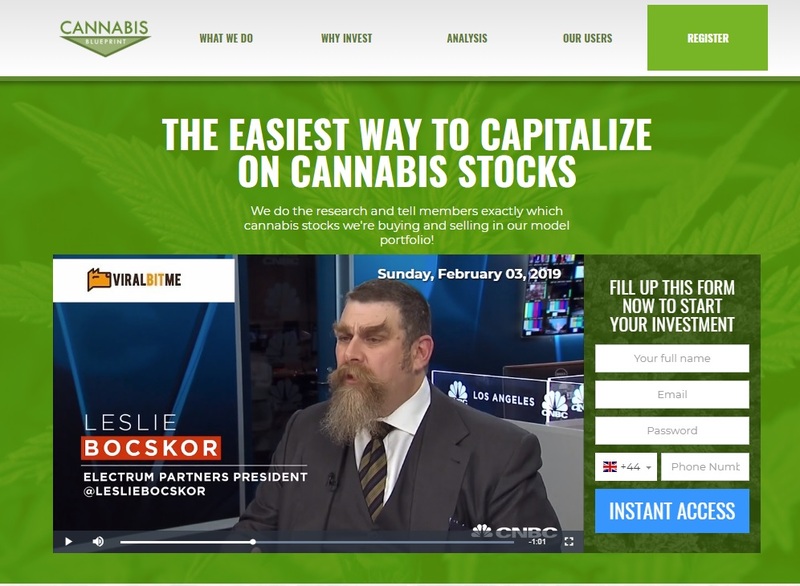 You can clearly see how they are using a well-known persona named Leslie Bockscor, to present their pathetic sales pitch and try to convince you that the Cannabis Blueprint is a great way to generate money. Here’s another really interesting piece of evidence. If you take a look where it says “leading the way”, you will notice a female doctor which is presented to us as Dr. Pettle (underlined in red). This is the same Doctor which as used in the Green Leaf Fortune SCAM, and in fact she is not a doctor at all. She is an image bank actor, and we found her image on the internet where she is advertised as a “confident doctor posing in a hemp field”. And of course the testimonials are totally FAKE! We found out that “Catherine Jones” does not really exist, and her image is plastered all over the internet. The same is true for Mark Anthony Velasquez and Mr. and Mrs. Rosacia. 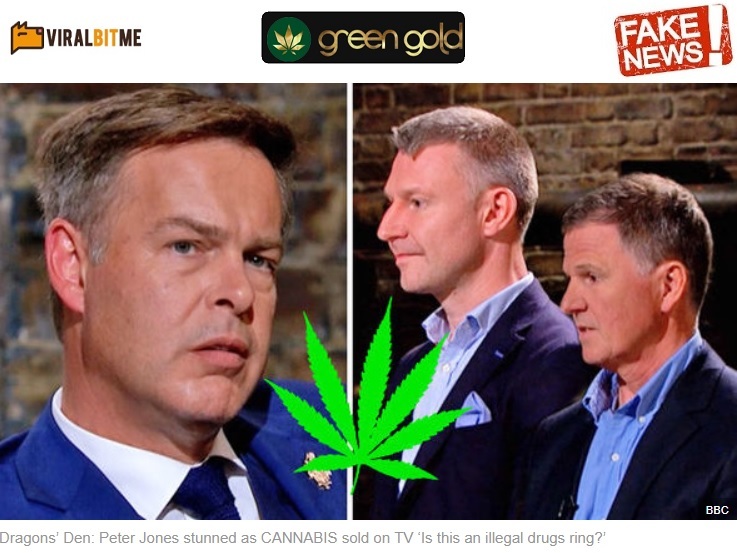 We also found some fake news and a bogus advertisement showing how Peter Jones from the Dragons’ Den is investing in a new cash-producing cannabis business venture. When we clicked the links in the fake advertisement we were directed to the Cannabis Blueprint scam software. And now for the final piece of the puzzle and last nail in the coffin. When we signed up the broker which was allocated to us was XMarkets, but the post registration was an exact clone and replica of the Cannabis Millionaire and Cannabis Fortune scams. This validates our initial suspicions and proves without a shadow of a doubt that the Cannabis Blueprint scam is a turnkey solution for affiliates and online promoters who wish to plugin to a ready-made system and start peddling their dirty schemes. What is Cannabis Blueprint and Who Is Dr. Pettle? Interestingly enough they don’t even say what it is. There is no mention of what software powers the system or how it really works. The success ratio varies according to each of the members presented, and we have already proven that the members are not real. The only thing they mention is CFD trading and how it can leverage potential profits for you. Dr. Pettle is non-existent (proven) and just used in a very manipulative way in order to promote a get-rich-quick scheme. Cannabis Blueprint Review, Legit Cannabis Stock Trading App Or SCAM? The whole concept behind Cannabis Blueprint revolves around Dr. Pettle, and they claim she has more than 20 years experience in trading and investing. They also say that her research was featured in various “respected publications”, but we could not find any reference to that. In other words, the scammers are telling everyone this fake doctor is an expert trader and now she is here to help you make millions. This has to be the most moronic sales pitch the staff here at ViralBitMe has ever seen (and we have reviewed more than a couple of scams). There is no proof of winning trades, no back testing, and nothing which indicates how the system looks like and performs. In other words, move on and never look back because this software executes losing trades intentionally and that’s how it steals your money. Actually it isn’t. Gaining access to the Cannabis Blueprint scam CFD trading system will cost you at least $/€/£250. That money will be charged to your Visa or Mastercard by thieving offshore brokers like XMarkets. We have seen multiple fake Cannabis Blueprint reviews on YouTube as well. This is happening because these website owners are getting paid affiliate commissions for endorsing fraudulent software, so stay alert and message us if you are unsure about joining a program. If you still believe the Cannabis Blueprint software is a genuine pot stock trading app then maybe online trading is not for you. We have provided all the information required to prove that it is a scam, so if you still want to risk your money please don’t come back complaining. If you are searching for an alternative that actually works, Trade Cannabis Stock is definitely the way to go. Forget about the lies and hyped up claims. Trade Cannabis Stock offers reasonable return on investments without all the hype and lies associated with scams. We put it to the test and it performs as advertised so we are recommending it. The Cannabis Blueprint SCAM software, app, and automated trading platform (AKA Robot) is a Blacklisted get-rich-quick scheme. If you actually read our Cannabis Blueprint review, you would have noticed that the evidence our staff was able to compile is both compelling as well as tangible in the sense that it genuinely reflects the reality of how this ruse is being promoted by clever affiliate marketers these days. The fake news campaigns are also highly deceptive and have tricked victims into investing under false pretenses. So, to recap we are advising all our members and viewers to avoid the Cannabis Blueprint scam and seek alternative investment avenues. Should you require additional information please message us via our contact page. Another fake pot stock and get-rich-quick scheme just launched, and this time greedy scammers are naming it Cannabis Fortune (not to be confused with Cannabis Fortune Cookies). So what exactly is this trading software, and is Cannabis Fortune scam or legit investment platform? Our detailed Cannabis Fortune review will explain if you can really “make a fast fortune from Million Dollar Marijuana Stocks” or not. OK, so we’re not going to beat around the bush, or try to sell you the idea that Cannabis Fortune is a genuine trading system. The facts speak for themselves, and we BLACKLISTED Cannabis Fortune primarily because we started to receive complaints, but also because we actually signed up and tested the software. Suffice it to say, we ended up losing our initial investment (big surprise). After about 1 hour we had some rude sales reps profusely phoning us and claiming they represent a broker dubiously named “Hybrid Reserve” which is owned and managed by a company named SingleBell LTD and has a registered business address in the Marshall Islands. OK, so let’s start connecting the dots and try to understand why you are obviously being invited to join a scam. First, it’s no secret that Cannabis Stocks are doing extremely well, and there is much media hype around various stocks such as Canopy Growth, Aphria, and Cronos. This is happening because cannabis is being legalized across North America, and the use of marijuana for medical and recreational purposes in gaining legitimacy as well as recognition from politicians and big businesses. The scammers (affiliate marketers and media agencies) are very much aware of this trend and are riding this so-called “Cannabis wave of success”, only they are adding their own nasty little twist. You will be advised that “you can purchase CFDs” or a contract for difference. This is double talk for Forex, and while its true that CFD’s are easier to understand and potentially much more profitable than stock, the risk factor is high so unless you have access to the best possible software or professional guidance you had best stay away. Its also important to point out that there is a huge fake news campaign which is active RIGHT NOW. Savvy online promoters are using the cast of the Dragons’ Den, as well as reputation of wealth gurus like Elon Musk and Richard Branson to peddle their filthy cannabis scams. So if for some reason you are under the impression that Cannabis Fortune is a trustworthy program, we highly recommend you continue reading our Cannabis Fortune review because we exposed these crooks and their dirty little operation. Below you will see the primary sales page and registration area for the Cannabis Fortune scam system. Immediately you can see the hyped up claims about making a fast fortune and becoming a millionaire trading marijuana stocks. Now here we have proof that Cannabis Fortune us actually a clone and replica of the Weed Millionaire and the Weed Profit system. A quick look will show that the “How It Works” section is a copy/paste of the scams we mentioned. And now we are looking at evidence of a chain scam, which is a kind of production line scam that’s used as a copy/paste solution for affiliate marketers and advertising agencies looking to plugin to a ready-made automated trading solution (AKA Cannabis Bot). For those of you who have not signed up or are not familiar with these systems, what you are looking at below is the post-registration page for the Cannabis Fortune software. This is the same popup we received when we tested Cannabis Millionaire and Cannabis Software. In other words, what you are looking at here is a smoking gun and live proof that this is a copied scam and the only thing which changes is the broker, logo, and color scheme. This fake news add is constantly being recycled by the same ripoff artists, and it portrays members of the Dragons’ Den. In fact, Peter Jones and Deborah Meaden are constantly being used for these types of scams and they have made their opinions known in this context. As we mentioned previously in our Cannabis Fortune Review, the whole testimonial section is copied right out of the Weed Millionaire scam. The illustration below is a “side-by-side” type of comparison which proves exactly what these cheaters did and how they operate. What is Cannabis Fortune and How Does It Work? The Cannabis Fortune scam is a get-rich-quick cannabis scheme which promises to make you a millionaire overnight. In reality, what happens after you signup is something completely different. You practically get mauled by rude sales reps with strange accents who only care about getting their dirty little fingers on your credit cared details and stealing your money! Cannabis Fortune Review – 99.7% Accuracy Level Or SCAM? According to the Cannabis Fortune scam sales pitch, Cannabis penny stocks are about to go through the roof, and right now is your chance to get in on the action before its too late. The ripoff artists pulling the strings behind the fraudulent Cannabis Fortune software would have you believe that their system allows you to generate passive income on auto-pilot if you signup for their dirty app. However, Cannabis Fortune has nothing to do with marijuana penny stocks, and while its true that the software generates trading signals they are LOSING signals (confirmed). Additionally, there is no way in the world Cannabis Fortune has a 99.7% accuracy level, because that would mean almost every trade is in the money (successful). So that’s a blatant lie, and so is the rubbish about being deadly accurate, having a “bullet-proof” technology, and especially about easy withdrawals. No way! Get ready to part with at least £/€/$250, and that money will be charged to your credit card by thieving offshore brokers such as Hybrid Reserve. Oh yes, this is a very alarming development and very distressing. Fake reviews sites are endorsing Cannabis Fortune and telling everyone how profitable it is. They are doing it in order to collect their commission paychecks, because they are affiliate marketers and get paid referral money (hence the conflict of interest). So if you are unsure or hesitant, please leave a message via our contact page. If you still believe Cannabis Fortune is a genuine marijuana stock trading app, then you failed to understand how dangerous this fraudulent investment platform really is. Online stock trading is probably not for you, so please consider alternative ways to generate income. Our staff is constantly searching the internet for reputable trading apps which generate income consistently. Once such system is Trade Cannabis Stock, and we are constantly using it to generate revenue, so take a minute to check it out! The Cannabis Fortune SCAM software, app, and fake marijuana penny stock trading robot is a BLACKLISTED get-rich-quick scheme. The crooks behind this operation are well-known and have a terrible reputation for defrauding unsuspecting customers and opportunity seekers looking to cash in on a legitimate trading app. Again, in light of the overwhelming evidence our staff was able to produce, we urge our viewers and members to avoid the Cannabis Fortune scam and seek alternative investment opportunities. Should you have any additional questions or queries, please message us via our contact page. Stop the press! The new Cannabis Software SCAM investment platform by Paul Winden has been officially launched, and complaints are mounting by the dozens. In our detailed Cannabis Software review and investigation, we will demonstrate, prove, and provide clear-cut evidence of how the crooks responsible for promoting this viral get-rich-quick cannabis scheme operate. We would also like to point out that the affiliate networks and media agencies operating behind the scenes are well-financed and highly motivated. It has also come to our attention that these networks operate in tandem with sleazy offshore brokers. In our case it was XMarkets, which are very well-known ripoff artists with a registered business address in the Marshal Islands. Similar to other BLACKLISTED systems, the Cannabis Software CFD trading app is attempting to ride the so-called cannabis wave of success which has been prompted by regulators in Canada and the USA which now partially allow the legal consumption of marijuana for medical and recreational use. In this context, it’s no secret that stocks like Tilray (NASDAQ: TLRY) and Canppy Growth (TSE: WEED) are performing exceptionally well, and during these turbulent times everyone wants to get in on the action. Online marketers are not oblivious to this trend, and they are mustering all their resources and energies in order to create new fake pot-stock schemes. If you have an inquisitive nature and commonly search the internet for new and interesting money-making opportunities, then you have probably been exposed to some fake news articles. The fake news phenomenon is constantly growing, and in this case scammers are illegally using the name and reputation of the Dragons’ Den Cast, as well as wealth gurus such as Elon Musk and Richard Branson in order to peddle their filthy Cannabis Software scam online. So if you are intrigued, and for some reason believe that this software is a legitimate trading system, then we highly recommend you read our informative Cannabis Software review before risking your hard-earned money. Alright, so here we have the Cannabis Software registration page. A closer look will reveal that texts are extremely hyped up and designed to mislead, deceive, and manipulate the facts. Moving along, if you take a look below you will see that these liars are saying that you can “make between $7,000 to $10,000 in the next 24 hours with the Cannabis Software”. That is not only a blatant lie, its a stupid one. If this was the truth then we would have new cannabis software millionaires rolling out by the dozens on an hourly basis. And since this is most definitely NOT the case, we would have to assume that it is a lie designed to trap you and steal your money. And here we have a snippet from the fake news article we managed to dig up. You can clearly see that these cheaters are using the Dragons’ Den cast to promote investments in profitable “cannabis products”. It’s worth mentioning that the promoters of the Weed Millionaire software are using the same scam tactic. In fact, they are duplicating their advertising campaigns and just switching links. And for the final nail in this coffin. Here we can see the Cannabis Software post registration page. It’s very plain to see that this is a white label or some kind of turnkey solution for affiliates who wish to access a trading software and start promoting it in order to get commissions. Supposedly he worked as a software developer for a Wall Street investment firm who designed algorithms which analyzed the financial markets. He worked 16 hours a day but could not get ahead. One day his boss asked him to write a code for an automated Cannabis Trading robot for some wealthy clients, and he did. Eventually he understood that he could make substantially more money using the software himself, so he just left the office and started trading by himself. Today he is a multi-millionaire and he is offering you a chance to access his software. In reality Winden does not exist. He was invented by the scammers for promotional purposes. What is The Cannabis Software SCAM And How Does It Work? The Cannabis Software is marketed as “a powerful automated trading software that lets you trade cannabis stocks with ease”. They claim it has automated as well as manual signals. They say that the system works by pinpointing “lucrative trading opportunities in the markets”, and then proceeds to execute profitable trades with a high degree of accuracy. That is the sales pitch, but we know better! Cannabis Software Review Make More Than $7,000 a DAY Or Viral SCAM? How about that vacation you always wanted to take, or that expensive car? Paul Winden, an expert investor and software developer is offering you a chance to enter his exclusive club of cannabis millionaires by joining his Beta Test! His Cannabis Software is empowering traders by providing them with the opportunity to “get in on the growing cannabis stocks investments with ease!” That’s the sales pitch, and given everything we have seen here and the systems we already tested, you can bet your bottom dollar its a scam and you will end up losing your money if you join this program. They say it is free, but in reality you have to invest at least $/£/€250, and that money will be charged to your credit card by thieving offshore brokers such as XMarkets. We have seen multiple fake reviews, and you can bet your lunch money that the website owners who are publishing their reviews are not interested in providing their readers with factual and accurate information. In fact, they simply wish to deceive you by telling you the software works so they can get paid. Still Trust Cannabis Software SCAM? If after reading our Cannabis Software Review you still have this uncontrollable urge to risk your money and invest using this fraudulent investment platform, then maybe you should avoid online trading altogether and seek an alternative way to generate passive income. We searched, prodded, tested, and screened. What we found was a genuine automated trading system which produces consistent results over time. We managed to accrue a balance of €1,752 after a week, and our initial investment was €300. If you are looking for a viable alternative then Trade Cannabis Stock is it. The Cannabis Software SCAM CFD trading robot is a totally BLACKLISTED cloned app. The evidence our researchers were able to produce is both compelling as well as indisputable. Hence, we are categorically labeling the Cannabis Software platform as a confirmed get-rich-quick scheme and advising our members to avoid it. Should you have any additional questions or queries simply message us via our contact page. And here we go again with another viral pot stock scam, and this time its Green Leaf Fortune! And just in case you were wondering, we blacklisted the Green Leaf Fortune scam software and fake Forex CFD app because the evidence proves it. So if you believe that Cannabis is legitimate investment platform, you may want to take a minute and read our detailed Green Leaf Fortune review. The way we see it, Green Leaf Fortune is merely the latest in a growing list of get-rich-quick Cannabis scams designed prompted by the recent wave of success associated with popular Cannabis stocks such as Tilray (TLRY) and Canopy (WEED). Due to regulative easing in Canada as well as other states in the USA such as Colorado and California, the consumption of marijuana for medicinal and recreational purposes is now legal, so the markets are hitting new highs and reacting accordingly. Viral SCAM Alert! Green Leaf Fortune is a fraudulent and blacklisted trading platform which is getting viral right now. The crooks who are responsible for spreading this filth on the internet are affiliate networks who care nothing about legitimate investment opportunities in CFDS (contracts-for-difference). There are also multiple complaints in regards to the fact that there are offshore Forex and CFD brokers involved, and that these cyber-hooligans are really relentless con-artists who stop at nothing to get their hands on your money. When we signed up the broker which was assigned to us was named Hybrid Reserve. Well, we left nothing to chance and checked them out properly. Guess what, these guys stink to high heaven. Fact is, Green Leaf Fortune has nothing to do with legitimate CFD trading on cannabis stock, and everything to do with defrauding unsuspecting victims looking to cash in on a genuine trading app. Don’t believe us? Think we are exaggerating and not really on point? Do yourself a favor and take a minute to read our informative Green Leaf Fortune review because we exposed these crooks and their filthy operation. Below you can see the primary sales page and registration area for the Green Leaf Fortune scam. 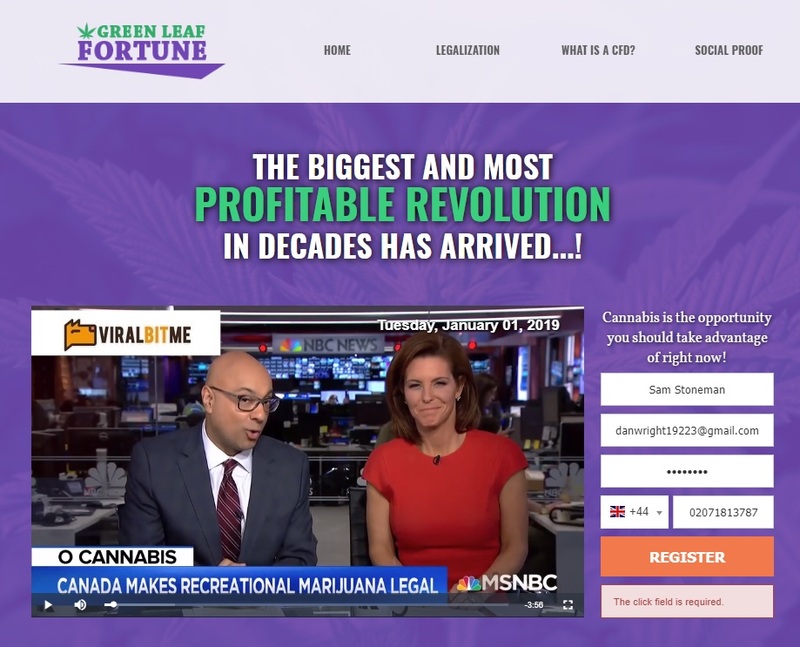 Its plain to see the recent hype around Cannabis Stock is creating opportunities for scammers, and the Green Leaf Fortune system is a perfect example. Moving along, the image below proves that the liars behind the Green Leaf Fortune CFD trading software are using doctored images in order to lend a more believable nature to their scheme. But we know better and everything you see here is a ruse. Moving on to the “social proof” section of the website. Here we can see that the scammers have completely fabricated the messaging from the cellphone text messages. A closer look will reveal that the fake text messages were copied from a binary options scam dubiously named the “Singapore Method”. Needless to say binary options have gained a notorious reputation and are now illegal in most places. And finally here we have the broker setup. After you register there is a popup which tells you the broker assigned to you. We have compared the the Cannabis Millionaire and Weed Millionaire scams in this context. As you can see below the setup is the same for all three scams, which means we are talking about the same affiliate network which is scamming customers and defrauding innocent victims by selling them fake Cannabis CFD contracts. What Is Green Leaf Fortune and How Does It Work? Green Leaf Fortune is a get-rich-quick cannabis scheme. It claims that it offers CFD (contract-for-difference) contracts which are agreements in which you predict the value of a share over a time-period. They claims that your investment is secure and that you will generate massive amounts of money using this software, but in reality when you invest the broker is not real and depositing money through this program is equivalent to sitting on a toilet and burning your cash. Green Leaf Fortune Review – Legit Pot Stock Trading System Or Fake App? In our opinion, the Green Leaf Fortune scam represents another crude yet effective attempt to ride the Cannabis wave of legalization. Medical and recreational marijuana are all the rage these days, and if you are on the sidelines watching the game you are probably looking for a way to cash in on the latest Cannabis Craze. The scammers are very much aware of these developments and increased awareness in pot stocks such as Canopy and Tilray. So, they are attempting to use this media hype and bait you into signing up with fake Forex and CFD brokers such as Hybrid Reserve. This is why you will hear catch phrases like “missing out on the opportunity”, or “live life to the fullest”. They primary sales pitch is that CFD shares are more profitable than stocks because you simply need to predict a direction (up or down), and if you are correct “you will make a lot of money”. In reality Green Leaf Fortune has nothing to do with legitimate CFD trading, and everything to do with tricking you into signing up with fraudulent offshore brokers. No, not really. It will cost at least $/€/£250 in order to get started, and that money will be deducted from your credit card so please don’t believe these liars if they they tell you that there are no fees involved (because there are). We have received numerous reports in regards to fake news in the form of advertorials or fake articles on social media. Some complaints have made reference to the Dragons’ Den cast, while others are mentioning Elon Must and the Shark Tank. Either way you look at it, this does not bode well for anyone looking for a legitimate investment opportunity in the thriving cannabis niche. Needless to say fake Green Leaf Fortune Reviews are already beginning to sprout, and that is primarily due to the attractive incentives online promoters are receiving for endorsing this bogus marijuana stock app. Make sure to inquire and stay super alert before risking your money! Still Trust Green Leaf Fortune? If you are still under the impression that Green Leaf Fortune is a genuine trading system then you will surely end up getting ripped off. We understand that the allure of easy money at the click of a mouse is very difficult to ignore, but that is exactly what you need to do. Just move on and never look back! We have examined the markets as well as various systems. Just when we were ready to give up we were able to locate a unique trading system which has been able to perform consistently for us. We invite you to take a minute and check it out. The Green Leaf Fortune scam software, app, and fraudulent investment platform is a verified get-rich-quick scheme. We have blacklisted Green Leaf Fortune (or misfortune in this case) because all the evidence our staff compiled leads to the obvious conclusion, namely that it is a worthless piece of rubbish designed to take losing trades. It is for that reason we are advising all our members and viewers to avoid this extremely deceptive and misleading scheme and seek alternative investment opportunities. Should you need additional information, please message us via our contact page. “Cannabis Share Values Are Going Through The Roof”, and this is the best time to invest! Or is it? Well, that’s what the greedy scammers at the Cannabis Trader scam software and automated trading app would have you think. But don’t be fooled for a minute, while its true that Cannabis Stock is higher than ever due to regulatory easing, what these ripoff artists are trying to sell you has nothing to do with this recent development. It does however have everything to do with fake Cannabis contracts sold by offshore Forex and CFD brokers (in our case it was a broker named Jones Mutual). What does all this mean? Well, in our detailed Cannabis Trader review we shall examine every aspect of this blacklisted Marijuana scam and try to shed light on how it works. In this context you must know that the Cannabis Trader scam is being very aggressively promoted by a new affiliate network which specializes in financial scams (hence the numerous complaints we received). We checked these guys out and they are well-funded and highly motivated, so make sure to hold on to your wallet because the Cannabis Trader platform is exceptionally successful at baiting and deceiving unsuspecting victims. Viral Scam Alert: Cannabis Trader SCAM is exposed and we have documented evidence and proof of scam and malicious foul play. But why is this happening now? It has to do with the fact that there is much media hype around Cannabis shares, specifically Canopy Growth Corp (TSE: WEED), and Aphria (APHQF). Clever scammers are very much attuned to these latest market trends and understand how to piggyback on the recent pot stock wave of success. You should also know that this is just the start of this recent “Cannabis Craze”, and there are many more fake weed scams waiting to be launched. Our staff will monitor these scams and alert the public about the deceptive and misleading nature of this new breed of get-rich-quick Cannabis schemes. Still believe the Cannabis Trader is a genuine or legit trading app? Keep reading our Cannabis Trader review because as much as we don’t want to be a wet blanket its critical you understand what you are getting into. Below you will find the Cannabis Trader primary sales page and registration area. Straight off the bat you can see that they are using excessive amounts of hype and exaggerated claims of easy money. That is the first indication that we are dealing with a scam. But wait, there is more. Moving along, here we see the Cannabis Trader software trading interface. If you look on the right side of the screenshot you will see that there is a section called “Auto Trading”, and the button below it indicates if the software is turned on or off. You can also see that the broker attached is named “Jones Mutual”, so if you put these two facts together what you get is a pot stock trading robot facilitated by a Forex and CFD broker with an address in Estonia. But there is no mention of signals or automated trading apps in the Cannabis Trader website, why is that? Are the alarm bells ringing yet? They should! And here we have the section of the sales page where it mentions that the Cannabis Trader is a “certified online trading platform”. But here the clue can be found in the information which is missing. Specifically, there is no mention of who has actually certified the software. There are no credentials or registered business addresses. It’s just a bunch of hot air amplified by excessive media hype and a sincere desire to fleece your wallet. Spam email marketing and annoying popups are a thing of the past. The hottest trend these days is fake news, and when the Cannabis Trader scam is concerned there is no exception. 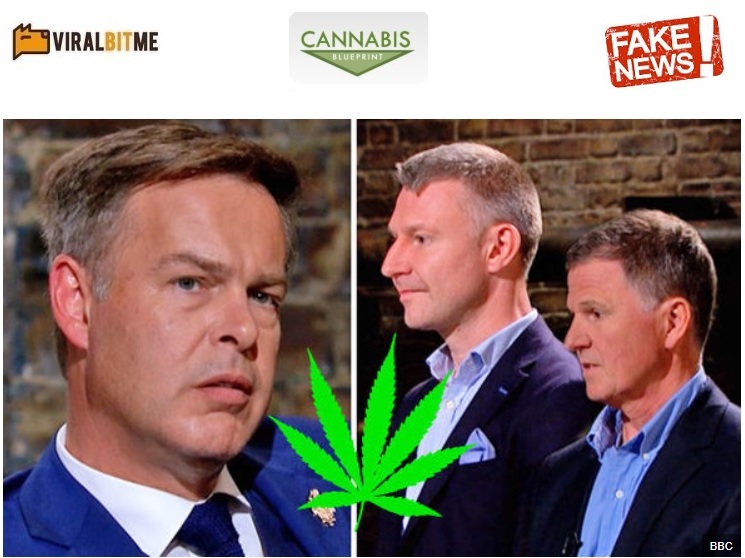 We have caught the cheaters who are orchestrating this ruse red-handed and peddling fake news articles entitled “Dragons’ Den Invests in Cannabis Product”. A closer inspection of the links inside redirected is to the Cannabis Trader scam, where all we needed to do is “register for the program and start making millions”. What is Cannabis Trader and How Does it Work? 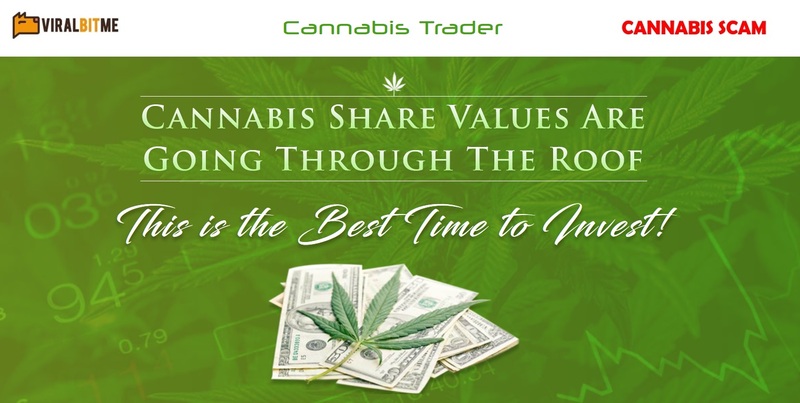 The Cannabis Trader is marketed as a “certified online trading platform” which “is looking for people interested in learning how to profit from trading cannabis shares”. There is mention of graphs and expertise advise, but there is no mention of any form of automated trading and that is either sloppy or worse because Cannabis Trader is a stock trading bot as we have already proven. Cannabis Trader Review, A Real Money Maker Or SCAM? 10 times higher profit potentials and shares growing TWICE as fast”. The cheaters behind the Cannabis Trader scam are distorting the facts and using half-truths to further their aims, namely to get you signed up and depositing with one of their brokers. Once you invest, the online promoters get kickbacks in the form of affiliate commissions, and you get left holding a bag of nuts. This type of scam is commonly referred to as a revenue or profit share scheme, it is very widespread in the Forex and online gambling niches. So while its true that Cannabis stock is on fire, the real people generating profits are the promoters and brokers. You will be the one paying for their lunch money and in return you will receive a hefty dose of remorse reinforced with guilt and frustration. So don’t signup and don’t say we didn’t warn you. Absolutely not! They even say it themselves, it will cost you at least $/£/€250 which will be deducted from your credit card. These crooks are also well known for overcharging, so make sure to keep your credit card information safe and never reveal it to anyone. If you feel a sudden urge to invest using the fraudulent Cannabis Trader software despite everything we have posted here, then maybe you need to take a step back and find alternative ways to generate income as online trading is most likely not for you. The ones to avoid are Cannabis Millionaire and Weed Millionaire. Fortunately our staff was able to identify a system that generates profits consistently. Trade Cannabis Stock trades stock as well as other assets and actually performs as advertised, we tested it ourselves so feel free to take it for a test drive. Cannabis Trader Review, Summary, and Helpful Tips that Work! The Cannabis Trader scam software, app, and fraudulent trading platform is a blacklisted pot stock system which was intentionally designed to steal your money. Its both pointless as well as counter-productive to invest through this bogus cannabis trading robot. In fact, we are so convinced that you will end up losing your money that we are willing to stake our reputation on it and issue a formal apology and retraction if anyone produces viable proof that the Cannabis Trader is a legit trading system. But obviously this will never happen so just avoid the app and move on to other more profitable trading software. Should you have any additional queries, please message us through our contact page. Its Marijuana Madness and this time the BLACKLISTED Weed Millionaire SCAM is getting viral. Our Weed Millionaire Review and SCAM investigation was prompted by various complaints which keep arriving, but that’s not the worst part. We also got wind that the Weed Millionaire scam is being very aggressively promoted by a professional fraud ring masquerading as a legitimate affiliate network. Well, if you are asking yourself what all of this means you are not alone! Our industry contacts advised us that the Weed Millionaire is actually a Forex scam which is being orchestrated by sleazy offshore brokers (we got stuck with a broker named GFC Investment). The fake pot stocks trend is very distressing, and its just starting to take off so hold on to your hats because this get-rich-quick scheme is flying high! If you have received some type of SPAM email invitation or exposed to various popup ads then you must know that you are being targeted by professional con artists who will do their utmost to get you signed up and depositing with one of their fake brokers. Why is that happening? Simple, every time you invest the scammers get kickbacks in the form of affiliate commissions. So we are not gonna just tell you to avoid the Weed Millionaire scam, we will actually provide valid proof and evidence that this fake Marijuana penny stock swindle is a facade for fraudulent Forex signals and automated trading software designed to bait and trick unsuspecting victims. Still believe the Weed Millionaire scam app, software, and fake signals system is a legit trading platform? Well, if that’s the case we urge you to continue reading our Weed Millionaire review because we exposed these crooks and our findings bode bad news for anyone who decides to risk their cash and invest. Below you will find a screenshot we took of the Weed Millionaire registration area. You can clearly see where it says “will you be the next weed millionaire?”. This is a strong signal that we are dealing with a get-rich-quick scheme. Moving along, here you can see that they are promising you an “incredible 99.7% accuracy rate” (scroll below to see). That pretty much means you can’t lose and whenever you hear figures like that you can pretty much bet your bottom dollar that you are about to get ripped off. And of course you can’t have a proper scam without some fake testimonials, so here we have “Mary Lee” who is claiming that “the green rush is so real! !” But “Mary” is really the principal of St Dominic’s College in Ballyfermot and her name is Sarah Green. Its interesting the cheaters decided to use a picture of an educational figure to peddle their Marijuana scam, you have to admit it is kind of funny so we give them an A for creativity. And here is the Weed Millionaire SCAM software. There is a manual as well as automated trading mode, which means its a Forex trading robot so hold on tight to your wallet before the scammers get a whiff of your money and steal it. There is a whole lot of chatter online about the Dragon’s Den Team investing in Cannabis products. Some of the news is actually true, but a lot of it is completely fake. We managed to get our hand on a Weed Millionaire Dragon’s Den SCAM fake news site, and after we started examining the links inside we noticed it lead to the Weed Millionaire website. This means there are deep pockets and professional online marketers who are invested heavily in this fake news campaign so hold on to your wallets and don’t invest! What is the Weed Millionaire And How Does it Work? The Weed Millionaire scam is marketed as a penny stock signals software which utilizes superior technology that “skips ahead of the market faster than any other system available today.” In reality its a fake signals app designed to drain your bank account by executing losing trades on Cannabis stock. Weed Millionaire Review, The Next Gold Rush or SCAM? The Weed Millionaire is marketed as a kind of pot stock signals trading software which produces a “99.7%” level of accuracy. They claim the technology is “bullet proof” and designed for both beginner and pro traders. It’s supposed to generate consistent wins, because it ‘skips ahead’ of the market faster than any other systems. However, in reality what happens after you signup is all too well-known. You get allocated a fake Forex broker who does not really care about Cannabis stock or any kind of financial asset. They just sell you some trading strategy and try to get you to reinvest, and they are relentless! Absolutely not. Its going to cost you at least $/€/£250 in order to get started, and brokers like GFC Investment only see that as a gateway or stepping stone to the bigger amounts they plan to make whilst using you as their personal cash cow. Yes there are some fake Weed Millionaire Reviews, and similar to the Cannabis Millionaire scam the website owners endorsing this get-rich-quick scheme are just as bad as the actual scammers (if not worse). They are colluding against you in what we believe is an obvious attempt to defraud and victimize innocent victims looking to cash in on a legitimate stock trading app. If after reading everything we had to write about the Weed Millionaire scam you still want to take it for a test-drive and invest some of your hard-earned money, then it’s quite possible you have not fully fathomed your situation. Don’t invest. Period. Our staff has started executing extensive testing for a new app named Trade Cannabis Stock. The software uses artificial intelligence for trade execution and is doing incredibly well for us. If you are searching for a real alternative that actually generates money consistently Trade Cannabis Stock is it. So take a minute to check it out (and it trades other assets too). 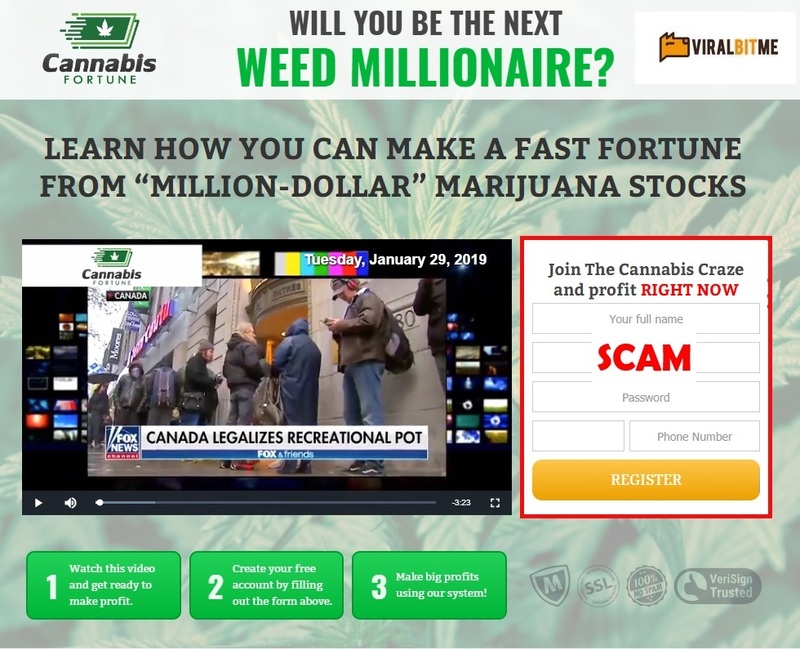 The Weed Millionaire scam software, app, and fake signals system is a losing get-rich-quick scheme which rallies exploits the media hype around pot stock. Our staff produced extensive proof and evidence of scam and in this context we implore you to refrain from joining this fraudulent software as we can guarantee with a certainty of 100% that your money will be stolen by clever con artists. Should you have any additional questions or queries simply message us via our contact page.